Student groups director Maklane deWever (pictured) addresses RSU board of governors after being voted as interim president to replace impeached president Ram Ganesh last night. 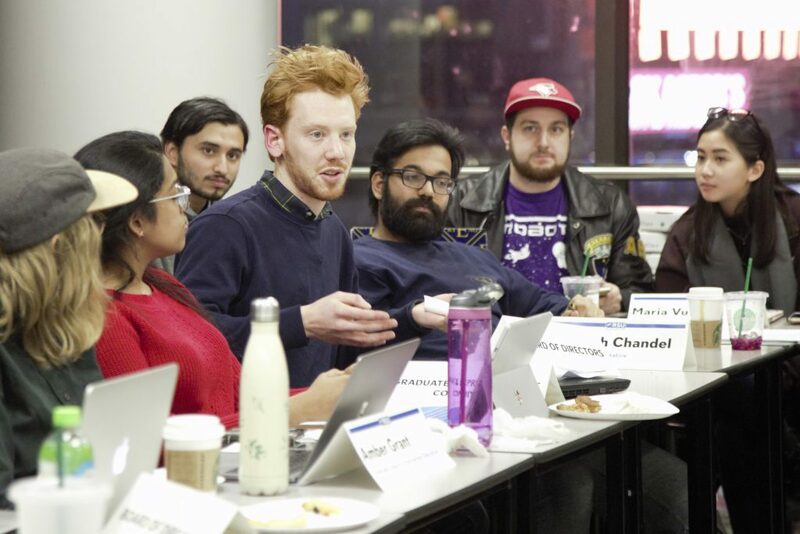 Ryerson Students’ Union (RSU) president Ram Ganesh was impeached Monday night in a two-thirds majority vote by the RSU Board of Directors (BoD). Ganesh was replaced by student groups director Maklane deWever, who was voted in as interim president by the end of the meeting. After an initial miscount, Ganesh was voted out of office by a majority of 24 votes out of 29 voting positions. Among the votes in favour of impeachment were those cast by vice-president operations Savreen Gosal, vice-president student life Edmund Sofo, and vice-president equity Karolina Surowiec. Ganesh himself abstained. He was present for the impeachment vote, but then left the meeting and did not return. The calls for his impeachment came after allegations of improper credit card use against Ganesh and his executive team surfaced last month. The claims allege that the team misused students’ funds for personal purchases. Motions to vote on the impeachment of the vice-presidents were also on the BoD’s agenda last night. However, the committee voted to strike these motions, after it was argued that the RSU would struggle with internal operations if all executive members were removed at once. Following Ganesh’s impeachment, Gosal was briefly the de facto president while the board debated whether or not she was fit for the role. BoD member Chelsea Davenport said that impeaching Gosal at a critical time would impair the RSU’s ongoing internal operations. Other directors, such as Divyansh Chandel, spoke out against keeping Gosal and other executives in any position of power. Gosal was ultimately put on suspension without pay in a majority vote. Her suspension stripped her of signing rights. After the board struck the impeachments of other executives from the agenda, student groups representative deWever was voted into presidency by nine votes. Two other nominees for the position, Faculty of Engineering and Architectural Science director Alessandro Cunsolo and Faculty of Arts director Shehroz Shabbir, each received six votes. Several members of the BoD abstained from voting. The BoD’s Iyvan Chandran, Faculty of Engineering and Architectural Science director, was also voted into an executive position. The vice-president education position was left vacant two weeks ago by Salman Faruqi. Chandran won the majority vote for this open position, running against second BoD nominee Chelsea Davenport. Faruqi left the RSU at the end of January, citing the allegations against the executive members, but saying in an email sent to the BoD that he wasn’t responsible for any unauthorized expenses. “As VP education, I was not privy to the transactions due to the limited scope of my position. Personally I have always reconciled my transactions accurately and in a timely manner with proper justification,” his email said. Former RSU vice president Daniel Lis chaired the BoD meeting last night. DeWever also spoke to rebuilding trust in the RSU among the student body. “Over the next two months I will be starting the long and slow process of earning students’ trust in the RSU through real and meaningful action,” he said. In a previous version of this story, The Ryersonian mistakenly identified Karolina Surowiec as the vice-president operations when in fact, she is the vice-president equity. The Ryersonian regrets this error.